The Web Team Now that’s what we call interactive! As most of you will know by now we’ve been working hard in the Web Team over the last 18 months to improve the user experience, primarily that for prospective students, especially the ability for prospects to get the information they need the most the quickest – namely course information. This has involved a redevelopment of the back-end course database, a brand-new course search facility (the even newer version of which will be revealed in a week or so), the addition of new ‘value-added’ course content across our subjects, a redevelopment of the design template, and the redevelopment and launch of the new external home page; smack-bang at the top of which is the course search box. 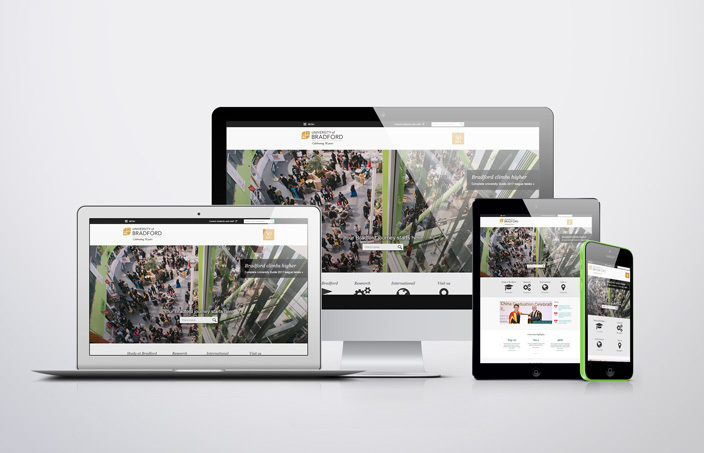 We’re really proud of all the work that has been put in from a content perspective, a design perspective and also a technical/back-end development perspective. So its really awesome to see the team’s work getting recognition from global companies. 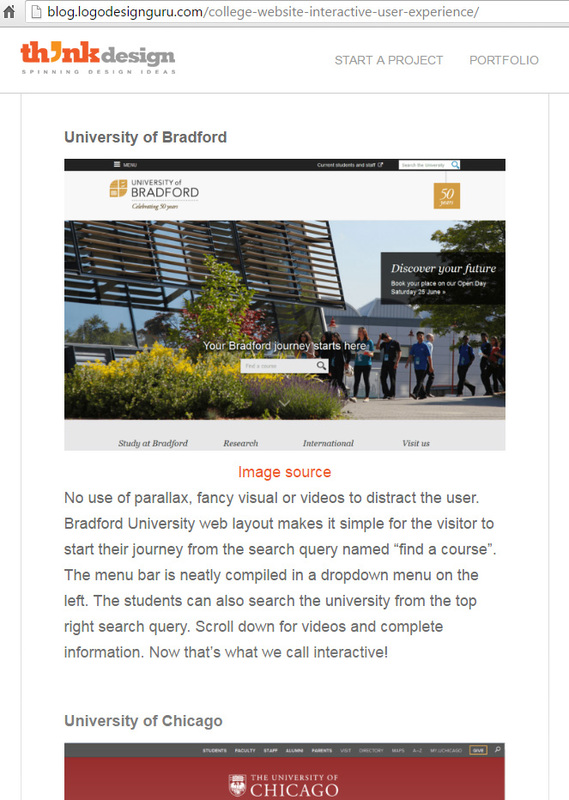 Only yesterday US graphic design website, Think Design, cited us as one of 13 College Websites That Hold A Record For Interactive User Experience – we were the only UK University to be mentioned and they noted that “Bradford University web layout makes it simple for the visitor to start their journey from the search query named “find a course”. Thanks guys – we’re glad you like it! Now that’s what I call interactive! This follows on from a global webinar hosted by TerminalFour back in April entitled ‘The Course Content Dilemma’. 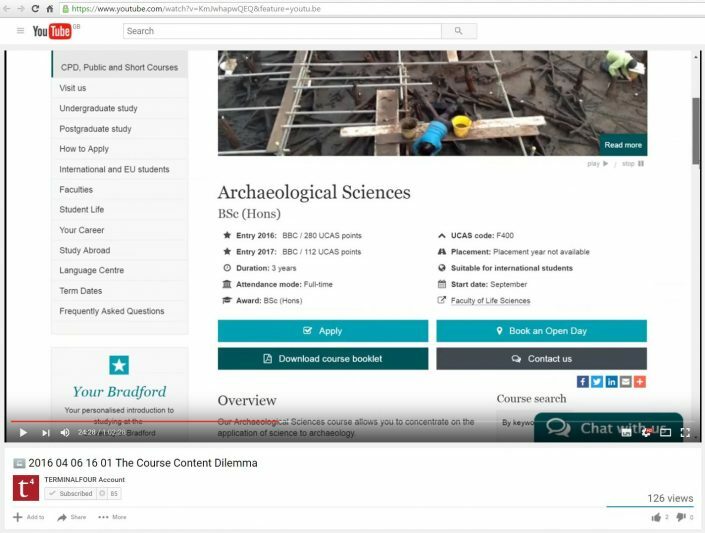 The webinar, attended by web experts from all over the world, set out some of the challenges that educational institutions face when developing online course content and gave two exemplars of where universities were getting it right – and we were one of them! You can see the full webinar here (link to YouTube, will open in a new tab) – we make a starring role at around 24 minutes in. We pride ourselves on putting the user first and using up to date web technologies and conventions where appropriate, rather than for the sake of it. Paddy highlighted some of the trends we have adopted (or not) over the last few years in his post from November last year. It’s great to see the work that we are doing recognised by other experts in the industry, especially those who don’t work exclusively in HE.